Customers tell us, "I love how Zerorez cleans so thoroughly. The carpet looks and feels clean and it stays cleaner much longer." Zerorez Franchising Systems, Inc., franchisor of the Zerorez® franchise entities across North America, celebrated an historic year in 2015. The year produced record revenue growth, and the Zerorez organization achieved its 7th consecutive year of double-digit growth. In addition, Zerorez grew from 35 locations to 42 locations in 27 states and added nearly 10% more mobile units to its expanding service fleet. “The continuing success and expansion of our brand are a result of our outstanding comprehensive cleaning process and our Empowered Water™ technology, but our progress really is a tribute to the dedication and hard work of our franchise owners and team members across the country,” said Richard Arnold, Chief Operating Officer at Zerorez Franchising Systems, Inc. In January 2016, Zerorez® has opened an additional location in South Carolina and is working on potential locations in Virginia, Indiana, Illinois and Missouri. A number of other markets are available and significant franchise opportunities exist for individuals desiring to become part of the strong and growing Zerorez® brand. 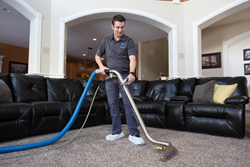 Zerorez®, one of the leading carpet cleaning franchise options in the industry, boasts an innovative and technically superior way to clean carpets and other “living surfaces.” The company’s patented cleaning system is completely green and does not use harsh or aggressive chemicals to clean. Instead, its revolutionary cleaning technology employs Empowered Water™, manufactured via a scientifically proven process, which changes the water’s molecular structure by softening it, removing heavy metals and then processing the softened water through a generator that electrolyzes and oxidizes the softened water. This creates a powerful cleaning solution without harsh chemicals or toxins. Zerorez Franchising Systems, Inc.’s corporate offices are in metro Salt Lake City Utah, and its franchise organization is coast-to-coast in 27 states. In recognition of its cleaning efficacy, the Carpet and Rug Institute (CRI) has awarded Zerorez® its Platinum Rating, the cleaning industry’s highest rating. See http://www.zerorezfranchise.com for more information or to contact the corporate office.